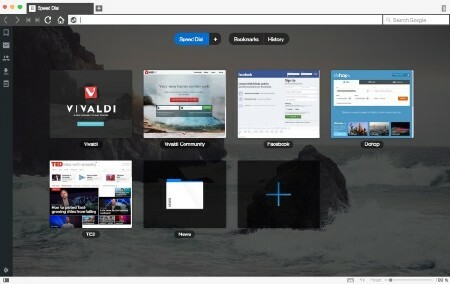 Vivaldi 2.3.1440.60 Final Portable » SoftLab-Portable.com - Portable Soft! A browser that is fast, but also a browser that is rich in functionality, highly flexible and puts the user first. All of your favourite sites easily accessible from one place. You can also create multiple Speed dial groups. Organize your sites based on interests such as Sports, News and Tech, or different context such as Work, School etc. It’s also possible to add a folder as a Speed dial entry. Are you a keyboard person? Then you’re in luck. Quick Commands allow you to quickly search through various settings, history, open tabs, bookmarks and more with a single keyboard shortcut. We aim to make the Quick Command menu highly customisable, allowing you to make your own commands and run them quickly. Take notes while browsing and add screenshots right in the handy Notes panel. The notes will automagically remember which site you were browsing at the time and allow you to add tags, to easily organize and find them later. All of your favourite sites easily accessible from one place. You can also create multiple Speed dial groups. Organize your sites based on interests such as Sports, News and Tech, or different context such as Work, School etc. It’s also possible to add a folder as a Speed dial entry. It’s a pretty powerful feature. Too many unorganized tabs can become a bit messy, making it hard to find the tab you are looking for quickly. Organize your tabs using Tab stacks! It lets you group multiple tabs under a single tab. Just drag a tab over to another for easy grouping.